Contrary to some absurd allegations, we’re Totally Not Aliens! After all, who’d give up a perfectly comfortable life on Glarblzork V just to move to such a barbaric backwater planet like … – Well, nobody would! You’d have to be out of your mind or forced to transfer as part of a disciplinary action, which is like… super unrealistic, right? Let’s move on. In the spirit of inter-human collaboration, we’d like to share some information about us and if you then feel compelled to do the same, we’d be very happy to read whatever military and politically unimportant thing you have to say – like, for example, the location where our species’ first interstellar spacecraft is being built. We’re a team of three humans, located in Bamberg, Germany. (Come for the beer, stay for the… uh… beer again, I guess.) We’ve all worked at established companies before, but now we want to do our own games! Presenting: Jenny – not your typical artist! After all she studied Computer Sciences, but you wouldn’t guess it from her fabulous art. Part-time adventure fanatic, she knows how to solve puzzles and problems – usually by just trying stuff. So, hands-on and determined, she’s the one to fix everything, while the others are still complaining and theorizing about a plan on how to potentially approach the problem… maybe… in the future. Alex – the Game Designer who’s learned something useful. Which means he’s primarily our Programmer now. With the heart for perfection and brains for efficiency, he’s the one to quickly deem a system inadequate and rewrite it within the timeframe of a single brutal growl of his favourite death metal band. I guess an affection for iteration and perfection is one of the typical byproducts of playing tons of Dota2. Julian – the Game Designer who didn’t learn anything useful, so he can use the full capacity of his mind to focus on combining his passions for complex simulations and interactive storytelling on his quest for the Holy Grail: the perfect interactive storytelling system. Pen&Paper RPGs and Grand Strategy Games, occasionally also living and breathing, is what he spends his days and nights on. “It’s important research!” – at least that’s what he wants the others to believe. Can you guess what the game will be about? And if you can: Did you do it with your telepathic abilities, that every human has, if I’m not mistaken? 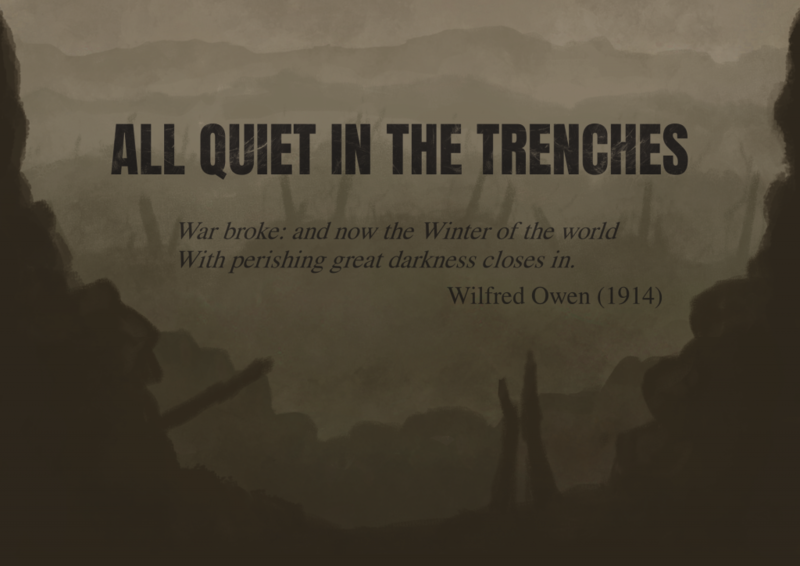 Or did you simply visit the All Quiet in the Trenches website to learn more about it?